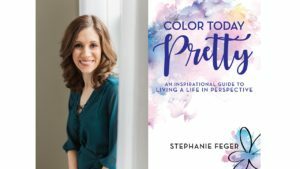 Spurred to capture her everyday moments turned extraordinary, Stephanie Feger ultimately created a book that helps you peer deeply into your spiritual psyche. Through her powerful true stories, she inspires you to lead your own life more richly by being open to the personal growth that can occur through life’s disappointments and hardships. Color Today Pretty is more than a book — it’s a way of living that underscores the need for compassion, curiosity and unwavering love. Come with Stephanie on an exploration of how to love, forgive, appreciate and awaken, and on an intimate walk with God. When you feel a calling to do something, it’s hard to ever question the journey to get there. Cathy was an answer to a prayer of mine, helping me complete a collection of stories that God called me to write. I truly value her expertise as I was lost and unsure on how to navigate the process! I am forever grateful for her belief in me that my story mattered and her commitment to help guide me to make my book happen. Cathy is amazing and is someone I would recommend to anyone, no matter where they are on their author journey! To order your copy on Amazon, follow this link.